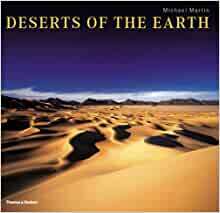 A photographic tour of the world's major deserts includes the landscapes of the Great Sandy Desert, the Great Basin, and the Kalahari as captured by the photographer during a five-year motorcycle tour and in the face of significant political and physical odds, in a volume complemented by text on each region's distinctive attributes and natural wonders. Michael Martin has won numerous awards for his photography. His most recent book is Deserts of Africa. How exciting is that. I remember Michael Martin from his first slide shows in Germany. He started traveling to Africa as a very young man on and presented slide shows of his adventures in the community and city he lived in. Later he gave slide shows all over Germany and than he published books and calendars. I have always been facscinated with his stories and the quality of the picture he takes. And with his studies in geology he provides very interesting background information about the regions that he travels to. I am very excited to see that his books are now offered now in English. I highly recommend to pick up a book and see for yourself. It will take you into a different world, a wonderful world - Enjoy. The pictures are excellents and the subject is very intriguing. I'd like knew (and see) something more about the process of doing the book, traveling, taking pictures, meeting people; more backstage, in a word.